Government | WorstPlans.com updates every Monday! Does your city / state / country have an ICON, or just a flag? Vex vexillologists with this proposal to create ICONIC EMBLEMS to represent your favorite regional administrative division! This is the U.S. State Flag edition. Every US state has a flag. But only a few states have an icon—something immediately recognizable (and ideally, easily drawn and memorable). For an example of icons, we can look at Japan’s provinces (or “prefectures”), nearly all of which are represented by a distinctive single-color icon (Figure 1). Fig. 1: Japanese provinces have iconic minimalist symbols associated with them. Compare these to the selection of American state flags in Figure 2. Fig. 2: Most state flags were not selected with visual clarity in mind. Additionally, many state flags look identical on a flagpole when there is no wind. Every state will get a supplementary icon, that can be easily rendered in a quick pen sketch (Figure 4). When possible, the flag and emblem should be similar, to make them easier to remember. A flag should be visually distinctive even when on a draped piece of cloth. For example, the American flag (🇺🇸) is easily identified even when there is no wind. A flag can make use of multiple colors (although there is such a thing as “too many” colors). An icon should minimize or eliminate reliance on specific colors. An icon should have relatively few fine details. It should be distinctive even at a very small size. Fig. 4: Some sketches of icons that could represent specific states. 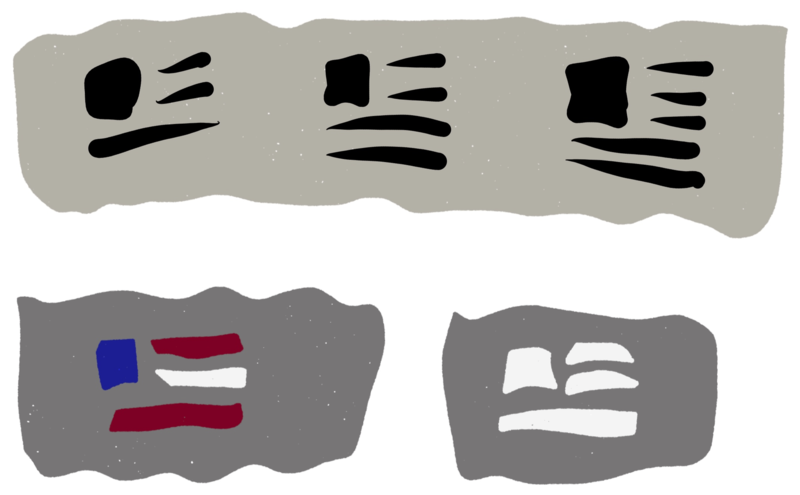 Three of these are based on elements from real state flags: Tennessee (top left), New Mexico (left middle), and South Carolina (palm tree + crescent moon, top right). The top right one would probably need to be modified in some way to distinguish it from the flags of Turkey (🇹🇷), Tunisia (🇹🇳), Pakistan (🇵🇰), and others. There is also no icon that represents the United States (although “USA“ works as an easily-written shorthand). Figures 6 and 7 investigate some elements that could be incorporated into a flag-inspired icon. Fig. 5: Although it is not a national icon, this existing U.S. Air Force insignia manages to elegantly incorporate the elements of the national flag. Fig. 6: If someone only had 5 seconds to draw an American flag, they’d probably some up with something similar to these graffiti-like icons on the left. 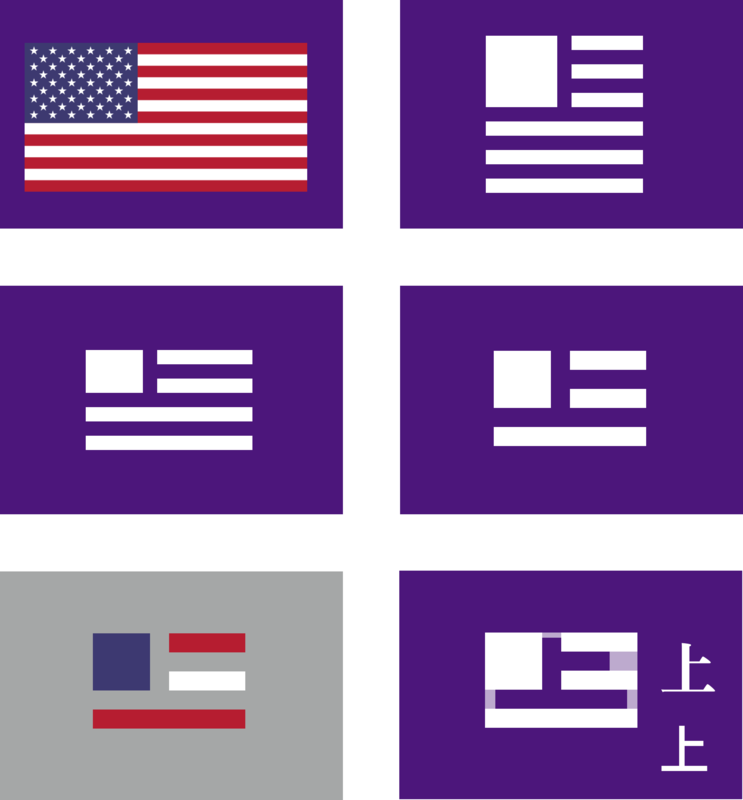 Isolating the iconic elements of the American flag leaves us with a number of possible emblems in varying levels of detail (right). The bottom-right one also indicates how the Chinese / Japanese character for “above” coincidentally appears in the negative space: this might be useful in a U.S.A.-and-China-centered science fiction future like the one in Firefly. Below (Figure 7) is a column of state flags (left) and some potential icons (right). The color is arbitrary—it can be omitted or changed to any other color (as in the Japanese example in Figure 1). Fig. 7: Left column: state flags. Right column: corresponding easy-to-draw icons for each state. Some of these have a very shaky rationale, and are not based on the existing flags. For example: Illinois: rivers converging, also it’s the “Y” from the font “Malayayam Bold.” Florida: the shape of Florida, if it were exactly three pixels. Michigan: the bordering lakes. Louisiana: the Mississippi river delta. Vermont / New Hampshire: the icons fit together, like the states. See below for Washington State. You should come up with some icon suggestions of your own, and propose them to your state government. They love sponsoring things like state birds, state flowers, and state songs, so why not a state emblem? California even has a state lichen and state dinosaur! PROS: Would provide the option for people to promote their state with an easily-recognized emblem. CONS: Could increase intra-state rivalry if people become attached to their own state’s amazing icon. P.S. The hypothetical icon for Washington State is an abstract representation of Washington crossing the Delaware. Perhaps a bit of a stretch, but that never stopped icon designers before! P.P.S. Run out of icon ideas? Just draw a bunch of weird stuff on a sheet of paper and see if anything sticks. Try to avoid accidentally repurposing fascist iconography! One trick of common courtesy that would give you a new sense of satisfaction from paying your taxes! It’s always polite to write a thank-you note when you get a gift. Especially if it’s a large sum of money! The various benefits of a stable government are generally abstract and far-removed from the taxpayer. But the pain of paying a huge chunk of money is obvious and immediate! Governments across the world might benefit from sending a “thank you” note to each taxpayer, indicating what the money was used for! Fig 1: A taxpayer who didn’t make a lot of money during the year might get a letter that looked like this. Fig 2: A taxpayer who made a larger sum of money might get a more interesting thank-you note. The wizard hat was probably grossly overpriced, however. Fig 3: Sometimes, your tax dollars wouldn’t actually be enough to pay for the entirety of a specific purchase. In this case, the fraction purchased would be indicated, and the picture would be partially grayed-out to match. For example, this person’s tax revenue was used to partially buy an octopus, but their contribution alone was only sufficient to pay for five of the octopus’s eight legs. What strange and secret purpose did the government need an octopus, anyway? Well, the answer is █ ████ █ ████ ██, ████ ██ █████ ██ ██████████ and also ████ ██ ████ ███ █ ████ █ ██████ ████ ██ ████ ███ ██ ██ █ ██ ██████████ . This is a great idea! The many readers of this post who work at the IRS should lobby to have it implemented immediately. PROS: Increases both accountability to the taxpayer of tax revenue and the personal connection of citizens to their representative government. Supplementary Figure B: Original “taxpayer thank-you note” mockup. THE CITY GRINDER: The one relentless trick that will DRAMATICALLY CHANGE your property values! Read up before you buy property, or soon you will weep bitter tears of despair! Fortunately, with an amazing new idea, we can revitalize urban development and create guaranteed construction jobs. Build an elevated circular track around City Hall (or some other centrally located building). Next, build an enormous miles-long spiked roller that rests on this track (Fig 1). The outer edge of this “city grinder” should reach to the farthest extent of the city. The city grinder will now make a slow revolution around the city, consuming everything in its path. Fig 1: The “city grinder” is a giant spiked roller (left) that levels everything in its path. It is mounted on an elevated circular track that is centered on city hall (right; the building with a yellow roof). In this example, the roller is traveling counter-clockwise (see arrow). Not shown: the roller should actually be rotating quickly in order to grind the buildings it encounters. The actual time required for a full rotation could be set based on the circumstances of the specific city. Perhaps 100 years for a full rotation would be reasonable. Although this idea may seem unorthodox, it isn’t without precedent: some places have 99-year leases or even 999-year leases instead of permanent ownership. Thus, the “city grinder” is just a strong formalization of the 99 year lease—except a property won’t just revert to government ownership after 99 years, but instead will be ground into dust. Fig 2: An example of city grinder transit over a 100 year period (as indicated by the numbers; note that the grinder is in the top-right corner of the map in both 1900 and 2000). The star indicates the city hall (or other “center” location). At 100 years for a complete revolution, the city grinder will only need to cut through 3.6 degrees of the city per year. For a circular city that is 10 miles across, the outermost (fastest) point on the city grinder would be traveling at a mere 4.5 feet per day (or 1.4 meters / day). (City circumference = π × 10 miles = 31.4 miles. 31.4 miles / 100 years = 4.5 feet per day). The only remaining logistical question is: how does traffic pass through the region being ground up? Luckily, this can be easily solved by breaking up the roller into many independent-operating sections that can be elevated. So only a small portion of the city grinder would be blocking traffic at a given time, and this segment could easily be driven around. This wouldn’t be any more difficult than dealing with railroad crossings, which all cities already handle. PROS: Prevents accumulation of obsolete and decaying buildings in a city. Improves urban beautification. Architects and construction workers will have guaranteed employment. CONS: The roller may be expensive to operate and maintain.